� Ross is the first U.S. woman to start her career with three FIVB victories before winning domestically. � Ross became the first U.S. woman to win FIVB Rookie of the Year in 2007, one season after winning the AVP's Rookie of the Year award. � In Chicago 2009 Ross and Kessy became just the sixth team worldwide to surpass the $1 million mark in career earnings as a partnership. � In June 2010 Ross won on her 28th birthday, becoming the sixth female to win a title on her birthday. � From October 2008 through the 2010 Moscow Grand Slam, Ross and Kessy played for a medal in 17 of their 20 FIVB events (winning seven golds, six silvers, three bronzes in that span). � In the 2014 AVP season opener Ross won in St. Petersburg and right afterwards her husband Brad Keenan won as well, making them the third married couple to win a pro beach volleyball event on the same weekend. � After winning the 2015 AVP season opener Ross and Kerri Walsh Jennings extended their domestic win streak to eight events and 41 matches. � Ross set a record in 2015 by becoming the first woman to win domestic titles in the same season with three different partners. � After finishing in second place in Chicago in August 2009, Ross won 27 consecutive AVP championship matches before losing in Seattle in June 2018. 2018: Ross and Alix Klineman played seven AVP tournaments together, winning the season opener as well as the final three events. The duo had a 30-3 match record, and won the final 15 matches of the year. Ross also played once with Caitlin Ledoux, placing second. Ross led the Tour in hitting percentage (.518), was second in aces (1.13 per set), and sixth in kills (7.34 per set). On the FIVB Tour Ross played once with Kelly Claes, then seven times with Klineman. Ross and Klineman won in their debut together and placed fifth four times. 2017: Ross played two AVP events with Whitney Pavlik, winning in Austin, then played three times with Lauren Fendrick, winning in New York in their debut. Ross led the AVP in aces (1.26 per set), was second in hitting percentage (.494), and was sixth in kills (7.23 per set). On the FIVB Tour Ross played once with Kerri Walsh Jennings, the played five times with Lauren Fendrick, with a best of second. 2016: Ross and Walsh Jennings started the season winning their first three AVP events, continuing their streak to 11 straight AVP titles as partners. Ross played the last event Kelly Reeves, finishing seventh. Ross ended the year leading the Tour in aces (1.27 per set), third in hitting percentage (.557), fourth in kills (7.29 per set) and sixth in digs (5.76 per set). Ross and Walsh Jennings played 11 FIVB tournaments together, winning five events and a total of nine medals, the most on the FIVB Tour. 2015: Ross and Walsh Jennings extended their streak by winning their eighth consecutive AVP event in the season opener. Ross then played three events with Jennifer Fopma, winning twice, and then once with Lauren Fendrick, winning in the season finale. Ross led the Tour in both aces (1.41 per set) and hitting percentage (.563), was third in digs (6.11 per set) and fourth in kills per set (6.89). On the FIVB Tour, Ross and Walsh Jennings played in seven events, winning one silver and one bronze. She also played three other tournaments with three other players with a best of fourth. 2014: Ross and Walsh Jennings won all seven AVP events, with a perfect 36-0 match record while losing just four sets. Ross led the Tour in both aces (1.24 per game) and kills per game (7.32) and was second in hitting percentage (.509) and seventh in digs per game (4.89). On the FIVB Tour, Ross and Walsh Jennings won four times in their 10 tournaments, tying for the most on tour. 2013: Ross and Kessy began the AVP season with two wins and two thirds, then advanced to the championship in St. Petersburg but due to weather the final was never played. For the final two AVP events, Ross partnered with Kerri Walsh Jennings, winning in their debut and placing third in the season finale. For the year Ross was the top-ranked player in terms of points. She also led the Tour in hitting percentage (.519), was second in aces (.93 per game) and fourth in kills per game (7.01). On the FIVB, Ross and Kessy played seven times and advanced to two semifinals, with the best of a silver. She also played three times with Walsh Jennings, winning twice, with Jennifer Fopma once and in the World Championships in Poland with Whitney Pavlik, finishing fourth. 2012: In the first seven FIVB events, the duo had a best of third once. In the 2012 London Olympics, Ross and Kessy won a silver medal. The pair ended the season with a win in Thailand, and again finished fourth in terms of season points. In three domestic events on two different tours, they won all three times. 2011: In the FIVB season opener in Brasilia, Ross and Kessy overcame a first-round loss to win a bronze medal, while in Shanghai the duo rebounded from a second-round loss to win a silver medal. They played in the test event in London in preparation for the 2012 Olympics, placing second. In the World Championships in Rome, Ross and Kessy placed fifth. For the year, the duo advanced to the semifinals in 7 of their 14 events, winning a medal each time including gold in the Stavanger Grand Slam. Ross and Kessy ended as the fourth-ranked team on the FIVB Tour. Domestically, they played in four events on three different tours, winning twice. 2010: Ross and Kessy began the AVP season with a third and then a fifth in Santa Barbara, ending a streak of 21 straight AVP events advancing to the semifinals. They then won the next four domestic events, and completed the AVP season with a 31-4 record, having won 24 of their last 25 matches. The duo played for a medal in each of the first five FIVB events, extending their streak to eight straight FIVB events playing for a medal, and collected two wins, before placing ninth in Stavanger. They failed to win a medal in eight straight events leading up to Sanya, where they placed third. 2009: Ross and Kessy appeared in the finals of nine of their 10 regular season AVP events, winning four times. Their win in Houston marked their first AVP title together after going 0-9 in title matches domestically. Ross led the tour in aces per game (1.29), and was fourth in hitting percentage (.481). On the FIVB Tour the duo won the World Championships in Stavanger, Norway, marking the fourth straight time a team from the USA has won that title. In Gstaad the pair finished fifth, ending a streak of 20 consecutive tournaments (AVP and FIVB) in the semifinals and six straight FIVB gold medal match appearances. Ross and Kessy also won in Marseille as well as the season finale in Phuket, increasing their total to nine medals earned in 12 events during the season. 2008: Ross and Kessy were in the semifinals in all but one AVP event, including five championship matches, ending as the third-ranked team on Tour. Ross led the Tour in aces per game (1.24) and was eighth in hitting percentage (.431). Internationally, Ross and Kessy just missed qualifying for the Beijing Olympics, finishing seventh in the world rankings but as the third American team. Ross and Kessy ended the FIVB season with a second place finish followed by victories on consecutive weekends. Ross recorded the FIVB's second fastest serve in 2008 (85.7 km/hr in Berlin). 2007: Kicked off her new partnership with Jennifer Kessy with a second-place finish in the season opener in Miami. The pair advanced to five additional semifinals, including another championship match. In Hermosa Beach they defeated Misty May-Treanor and Kerri Walsh in the winner's bracket, marking just the third time that duo had lost on the AVP Tour prior to the semifinals. Ross ended the season ranked in the top 10 on the AVP Tour in three different categories; second in aces per game (.99), sixth in kills (7.01) and seventh in hitting percentage (.440). On the FIVB Tour, their first event ended with a loss in the country qualifier. The next week, in the Stavanger Grand Slam, they became the lowest seeded team (29th) to win an FIVB event. After winning their country quota match and a pair of qualifier matches, they overcame two early pool play losses and won six straight matches to capture the title in what was just the fourth international event for Ross. The duo also placed second in St. Petersburg. 2006: Began her pro beach volleyball career playing with former college teammate Keao Burdine, and the duo had a pair of ninths in 13 events as Ross earned the AVP Rookie of the Year award. Ross ranked ninth on the Tour in hitting percentage (.433). 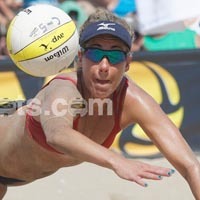 Competed in two FIVB events, with Barbra Fontana and Nancy Mason, with a best of 17th. � In the 2016 Rio Olympics Ross qualified with Kerri Walsh Jennings as the number three seeded team. The duo went undefeated in pool play, then advanced to the semifinals before losing to Brazilians Agatha Bednarczuk and Barbara Seixas. Ross and Walsh Jennings won the Bronze Medal by defeating top-seeded Brazilian duo Talita Antunes / Larissa Franca. � In the 2012 London Olympics Ross qualified with Jennifer Kessy as the fourth-seeded team. The duo went undefeated in pool play, then won three matches to reach the finals, losing to Misty May-Treanor and Kerri Walsh in winning the Silver Medal. College: Ross started every single match in her career at USC, and led the team in kills and points each year. She also led the team in digs until the start of the libero position in 2002. Ross was the National Freshman of the year, and was first-team all-Pac-10 each of her four seasons. She was selected second-team AVCA All-America as a freshman, and first-team as a junior and senior. Ross led the team to back-to-back NCAA Championships in 2002 and 2003, and was the conference's Player of the Year in 2003 as a senior. Twice she earned Academic all-Pac-10 honors. Personal: Ross, who has one sister (Amy), was the 1999 Gatorade Circle of Champions National Player of the Year. A "Fab 50" selection, she was also an honor roll student all four years. In addition to her four letters in volleyball in high school, she lettered four years in track and three in basketball. In the summers of 2000 and 2001 she was a member of the USA Junior National Team, USA A2 Women's National Phase 1 Team in 2002, and the Women's National Team in 2003. In November 2010 she married fellow pro beach volleyball player Brad Keenan.